Margaret (Maggie) Barnett, 90, died peacefully on Saturday, November 11, after a sudden illness. Margaret Mary Sheets was born on October 9, 1927 in Omaha, Nebraska, to Frederick Hobson Sheets and Agnes Mary O'Donnell Sheets. On June 7, 1947, Maggie married Dr. George Louis (Lou) Barnett of Sioux Falls. Early years were spent in Graceville, MN and Fort Meade, MD. The family settled in the Cathedral District of Sioux Falls in 1955. Maggie and Lou are parents of ten children, all graduates of O'Gorman High School. Their home was a center of faith, fun and music, always open to friends and neighbors. Over the years they enjoyed hundreds of musical performances and athletic events by their children and grandchildren. Maggie was a faithful, devout member of St. Joseph Cathedral parish for more than 65 years. She sang alto in the Cathedral Choir, was a member of the funeral committee and played bridge with the Cathedral Ladies' club. 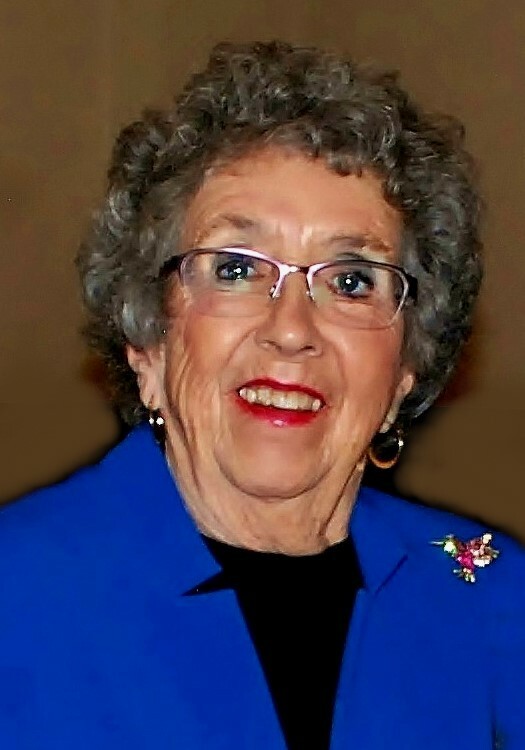 In her 60's she learned to play golf with Lou, and joined Elmwood's Ladies Golf group. She enjoyed her walks on the golf course, and loved lunching and playing cards with her golf lady friends. During Lou's years of medical practice, she was active in the McKennan Ladies Auxiliary. Maggie is survived by her beloved husband of 70 years, Dr. Lou Barnett, and their ten children: John (Shelly) of Salem, SD; Jim (Laura) of Sioux Falls; Margaret (Mike) Hooton of Pittsburgh, PA; Mary Catherine (Steve) Zahller of San Diego, CA; Bob of Pasadena, MD; Joe (Carrie) of Sioux Falls; Richard (Amy) of Sioux Falls; Bill (Jane) of Sioux Falls; Francis (Melissa) of Aberdeen and Martha Lyons of Tustin, CA. Also mourning her loss are twenty-three grandchildren, each of whom knew they were her favorite: Chris (Mila), Matt, Pat (Janelle), Justin (Erin); James Jr. (Tina), Kara (Brian) Pfannenstein, Katherine (Aaron) Beckstrand, Michael; Robert Hooton, Kate (Brian) Hearn, John (Emily) Hooton, Christopher (Christina) Hooton; James Louis Zahller, Margaret Ann (Mike) Enos; Steven (Sophie Rodriguez); Sarah (Shane) Meagher, Rachel, Maria (John) Maria; Julia, Joshua, Noah; Josephine and Thomas Lyons. She will also be remembered by her great-grandchildren, including Brendan, Emma and Allison; Cameron, Caden and Joslyn; McKenna; Jameson and baby girl due Feb. 2018; Patrick, Joseph, Thomas and Michael Pfannenstein; Madison; Margaret; Jack, Will and Finn Hearn; George, Hartley Grace and baby girl due November 15, Hooton. Maggie is cherished by her in-laws Don and Marilyn Barnett, Kay Barnett, and by her many nieces and nephews of the Barnett, Williams, Harris, Sanders, Baker and Sheets families. Friends will be welcomed by the family at the Cathedral of St. Joseph on Wednesday, November 15th beginning at 5:00 PM. A Scripture Vigil, followed by the Rosary, will begin at 6:30 PM. Mass of Christian Burial will be celebrated on Thursday morning at 10:00 AM. Guests are invited for a luncheon after the funeral. Maggie chose to donate her body to the USD Medical School. Graveside rites will be held at a later date. Maggie loved children and supported their educations. Memorials may be directed to Sioux Falls Catholic Schools for tuition assistance.